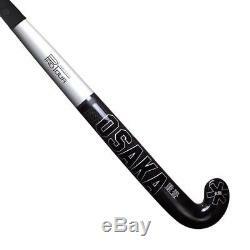 OSAKA PRO TOUR LTD SILVER COMPOSITE FIELD HOCKEY STICK. All Pro Tours are built mainly with a minimum of 22 layers of 3K Japanese Carbon Fibre, laid down in alternating orientations for the optimal balance of stiffness and unique Osaka feel. The Osaka Proto bow is the ultimate specialist stick, shaped to maximize the potential of FIH specifications. The maximum bow point lies at 250mm from the cross with a max height of 24mm, like the low bow. This combined with the unique grooved face and slim-dynamic profile make for a modern playing experience like no other. The design is focused on 3D ball control and drag-flicking speed and accuracy. Features: Specs - Pro Groove Bow - 24mm bow height - 250mm max bow position Handle - 30mm thick - Osaka Pro Touch 2016 BLACK (buffed and perforated) - 1,5mm VibraStop foam layer Head Construction - 45 degree angle - 115mm length - 24mm thick - Kevlar reinforcement CONSTRUCTION - 98% carbon - 1% Kevlar Cross reinforcement. 1% Aramid Backhand Blade reinforcement. Special Note (Custom Countries Charges). We send the stick as gift. According to the country law. The item "OSAKA PRO TOUR LTD (SILVER) COMPOSITE FIELD HOCKEY STICK WITH COVER+GRIP+GLOVES" is in sale since Monday, July 30, 2018.